It is named after St. Nicolas the Miracle-Worker. Wooden, it existed already in the middle of XVII century, and in XVIII it was replaced by stone. 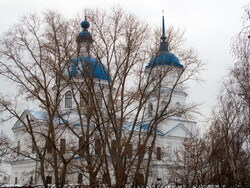 Nearby wooden warm Epiphany Church was built. By the beginning of XIX century both temples became decrepit, and in 1808-1818 in place of them one-altar stone temple was built with the money of church people. 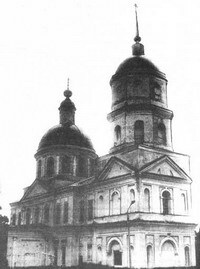 In 1848-1852 it was rebuilt into two-stone and three-altar temple with the money of merchant Alexei Ivanovich Staheev under observation of engineer Olehnovich. Above there was the main Nicola’s altar, below – warm chapels. Church in style of chaste classicism of unconventional composition had no protruding apsides, that’s why it reminded a civil building. Nicola’s Church was adorned very richly at the expense of church people – reach merchants. In the 70-es of the XIX century famous painter Vasiliy Vasilyevich Vereshchagin (1842-1904) took part in its painting, great part of this painting remained. In Nicola’s Church icon of St. Nicolas the Miracle-Worker was kept, it was found in locality Saint Grail near Mamadysh in the first half of the XVIII century. Every year religious processions with the icon were made to Mamadysh and they gathered a great number of devout people. Nowadays the Church is not active.